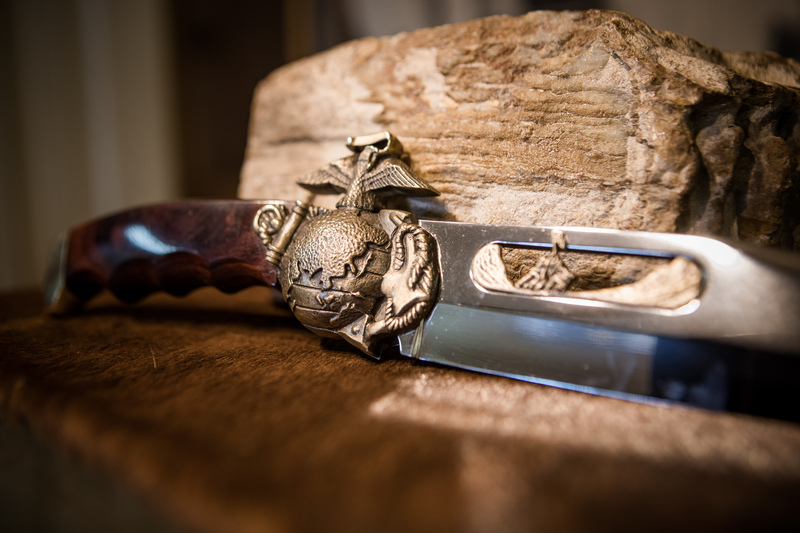 East Texas knife craftsman designs hand-tooled blades sought around the world. A shaft of soft light reaches through the front window of Dan Harrison’s custom knife shop in Ben Wheeler and dances on the edge of one of his custom Mako knives as he moves it gently back and forth in his left hand to demonstrate its perfect balance. Harrison designed the straight-lined Mako, one of many patented styles, in the 1970s. 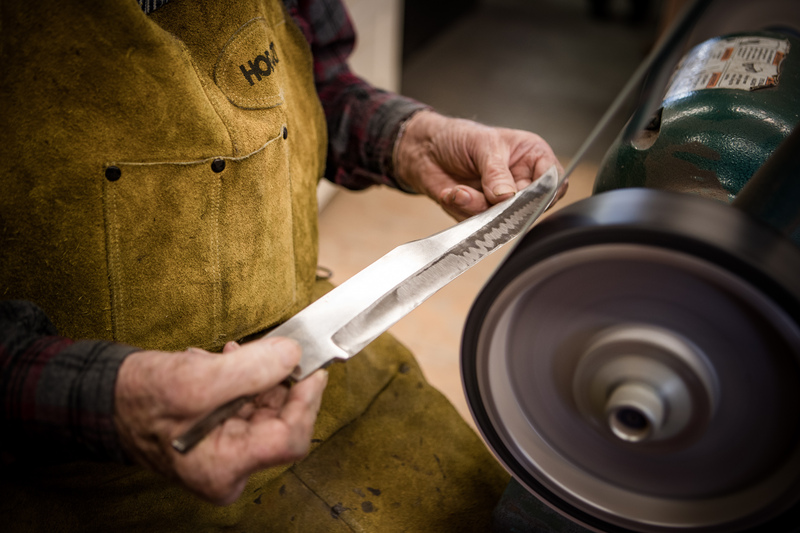 The rhythmic cadence of grinding steel from the back of the shop just about snuffs out the renowned craftsman’s gravelly voice and head-turning laugh — but not quite. Harrison is ruminating about how strange it is that for seven decades so many people — famous and not — from throughout the world have sought a knife from a guy in Texas. “The doctors tell me I’ve got no discs left in my back from working standing up all these years,” he says as he moves slowly over to a nearby stool. He picks at a haphazard pile of promotional materials and story clippings encased in plastic sleeves that document his years as a designer and craftsman. His well-worn camo U.S. Marines cap is pulled down tight on his head. Thick gray whiskers frame his mouth and chin, and a leather apron obscures a large portion of his denim shirt and jeans. The shop is a relaxed sort of place where locals and curious passers-by can browse, buy or just jaw a bit. Two weekend ranchers pop in to have their knives sharpened. Harrison’s shop mate — gray-haired, bespectacled Karl Fielding — attends to their needs. Fielding, a former truck driver, “showed up here from the North six years ago and has never left the shop,” Harrison informs me, loud enough for Fielding to hear. Fielding took to the trade. Today, he works in the shop daily, and his own custom knives are displayed here. The distance from Prosper in Collin County, where Harrison was born in 1936, to Ben Wheeler, about 12 miles from Canton, is a little more than 100 miles, but his journey here zigzagged a bit. The son of a farmer, Harrison started “messing around with knives” at 12. He identifies a nondescript knife on the lower shelf of a display case as his first creation. In his teens, the family moved to Dallas, where his father operated a small store. At 16, he bought his first piece of blank steel and heat-treated it, ran it through the whole process. 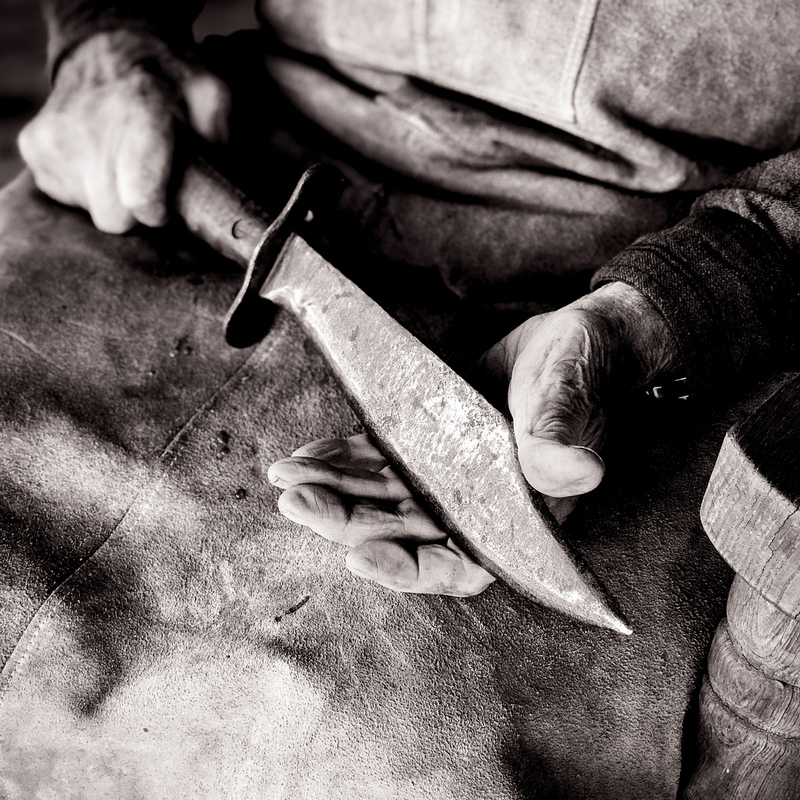 Harrison started exhibiting his knives at gun shows and gained recognition as a quality craftsman. He joined the Marines at 17, receiving training in artillery and rockets. When he completed his service, he worked with his brother as an aircraft mechanic servicing executive planes in Dallas until he reached 21, the minimum hiring age for police employment. He then joined the Garland Police Department, making knives part-time to make ends meet. As time went on, he began experimenting with other creations, such as bronze chess sets and aluminum dominoes that Neiman-Marcus carried. That attracted the attention of President Lyndon B. Johnson, Harrison says, who requested one of his knives. His designs also caught the attention of Kershaw Knives. He worked as a head designer for Browning, and then as consulting designer for KA-BAR, Knives of Alaska and Columbia River. “They all wanted what I was coming up with,” he says with pride. 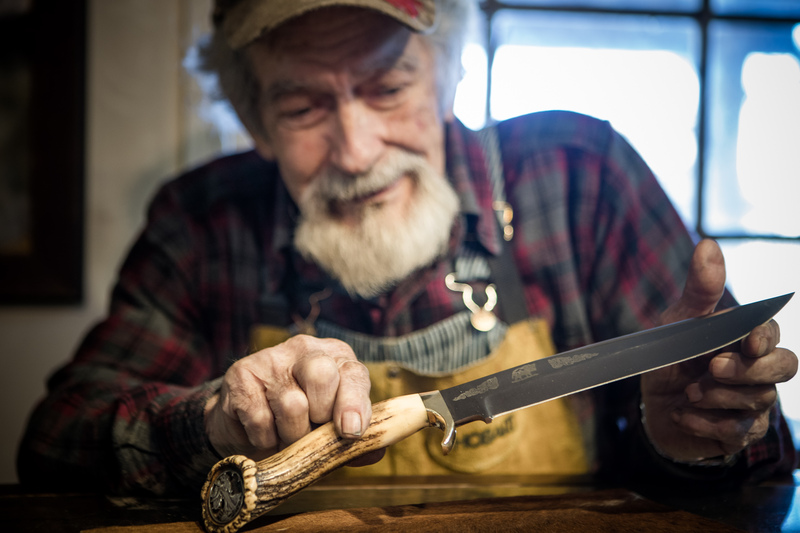 Forty-two years ago, Harrison moved as a full-time knife maker first to Overton, about 11 miles from Kilgore, and then to a farm in Edom, where he built a shop. He created finite-numbered collections of custom knives for the companies. In the late 1970s, Harrison started traveling the world representing the knife companies. The demands eventually took their toll. Semi-retirement didn’t agree with him, however. 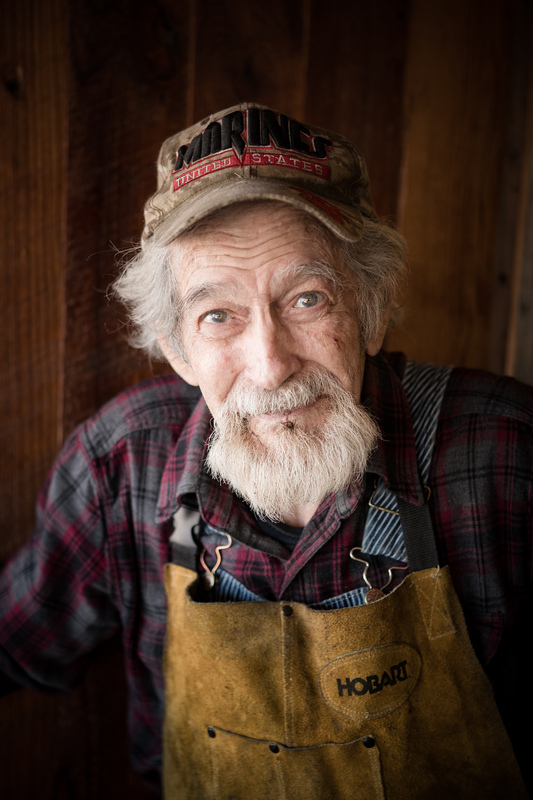 After Tyler-born Brooks Gremmels retired to Van Zandt County and established a foundation to bring Ben Wheeler back to life starting in 2003, Harrison was one of the artisans that Gremmels helped set up in town, with some of his original shop equipment. Now, he works eight-hour days, usually Wednesday through Sunday. His shop opens at 11. While most of Harrison’s handles are made of wood, he often uses other material, such as bone. Harrison pays homage to his time in the service by including military adornments on some creations. Harrison’s most expensive creation is the wavy-patterned Collector Kris. Harrison figures he’s made 300 “customs” a year during his career. He describes his process. 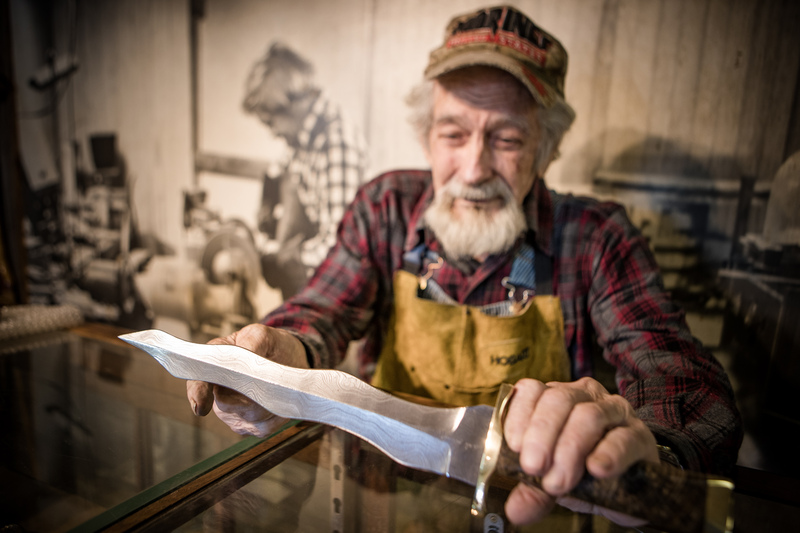 When Harrison met actor Sylvester Stallone, whose Rambo character was heavily connected with the work of acclaimed Arkansas knife maker Jimmy Lile and then later Kentucky’s Gil Hibben, the actor asked him to create something unusual for him. “I came up with The Solution, that knife-ax combination down there,” he says, pointing out the item in the display case. The Solution earned him Blade Magazine’s “American Made Knife of the Year” recognition in 1986, one of several industry accolades to his credit. A representative for the Queen of England sent her armorer over to get something made. “He made a trip to the shop, talked over options and then remained while I designed one for her,” Harrison recalls. His mainstay is The Old Ugly, which runs about $325. The most expensive of his creations is the Collector Kris, a wavy knife he points to in his display case. Harrison’s made only 20 of these ultimate knives so far. His wife, Carol, spent 40 years hand-stitching leather sheaths for his knifes and creating the artwork Harrison incorporated into his products. She retired last year. Harrison says that he intends to work until he is 90, and then go fishing. Even with 70 years of creative work under his belt, Harrison still has whimsical dreams he wants to achieve. John H. Ostdick is a Dallas freelance writer.